The Linebacker General Purpose Cable Ramp is suited to lighter duty or smaller cable diameters than the heavy duty variants available (see the full range of cable ramps here). The protectors are used to protect encased cables or hoses from vehicles passing over the top or from the environment itself. 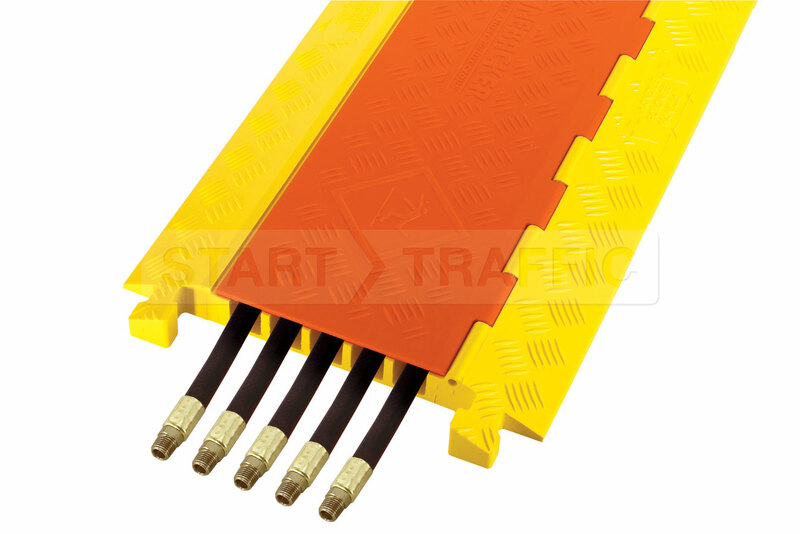 Each ramp section is 91cm long and can accommodate five cables of up to 33mm in diameter. The weight capacity of the general purpose linebacker is 9,526 Kg per Axle if you need a higher weight bearing capacity see the CP5X125. The CP5X125-GP is made from durable and hard wearing polyurethane that can withstand, hot cold and wet weather. The material is fuel, oil and water resistant so is ideal for use in factory and industrial environments. If you have any questions about our range of cable protection systems please call us on 01905 794 875 and speak to our sales team. Our sales team will be happy to assist you with any questions you may have or advice you may need.